It’s only when you want to start taking your basketball seriously that you need to really think about the ins and outs of your basketball hoop. For now, it’s all about making sure you have the right sized board for your play area and whether you want it hanging, standing or portable enough for you to take it places. Check out the best sneakers 2018 has to offer! If you’re jumping through hoops to become a respectable basketball player, you can’t really beat the Silverback In-Ground Basketball System. Providing you’ve got the ground to match the proportion of the board, it’s as close to pro as you’ll get. 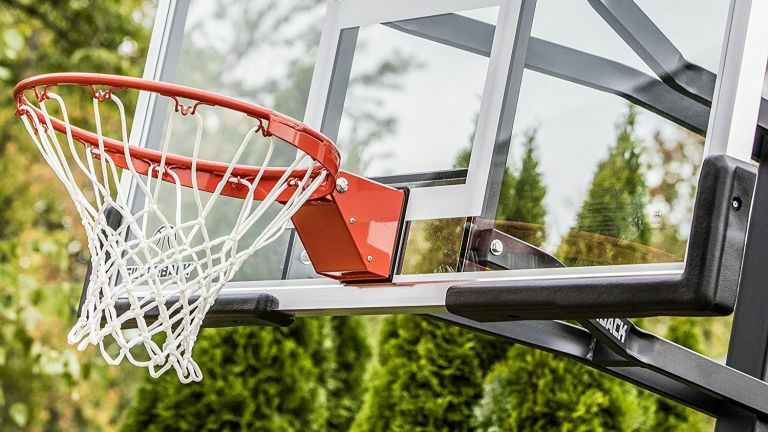 However, those looking to turn their driveway into a basketball court should probably look at something smaller, like the Lifetime Basketball Backboard And Rim System. It’s still large enough to give you a feel of the game, but its proportions make up for the fact that your shooting distance won’t be all that long. The best basketball hoop backboards will be made from tempered glass as it offers the right balance of strength and flex. Aside from that, if you’re looking to get as close to the real game as possible, you should be looking at a board ranging from 48 inches to 72 inches, which puts this Silverback comfortably in the middle. Thanks to the anchor bolt mounting system, the hoop sits securely in the ground but it can be easily removed if you happen to move house. If you’re looking for a good sized basketball hoop with a more realistic price tag, this one from Lifetime is a good choice. The great thing is it’s completely portable, all you need to do is fill the base with water or sand and empty it when you need to transport it. It features an all weather net, quick height adjustment and a shatterproof backboard, making it a reliable board for the money. There’s no excuse not to practise when it comes to this basketball hoop. Its small size makes it ideal for perfecting your shooting technique, even in the smallest of spaces, whether it’s a courtyard garden or that bit of space in front of your car. Although it’s made from steel instead of tempered glass, its structure makes it suitable for keeping outside all year round. If you’re struggling to keep your kids away from a screen for longer than 5 minutes, this mini basketball hoop is a great shout. It attaches to any wall and when paired with a soft basketball, makes a fantastic source of indoor entertainment. With its adjustable height, even the smallest members of the household can play and with heaps of users giving the quality 5 stars, we’re pretty sure it’ll last until they’re all grown up, too. If you want them to make the most of any sunny weather, purchase them this portable basketball hoop. It features a fairly sizable 32inch backboard that can withstand everything the British weather can throw at it. It’s fully portable, just fill the base with sand or water, and you can adjust the height of the basketball hoop as they grow. With a 5 year limited warranty, you know that this one is going to last. Not everyone is going to have the space for a 24 inch basketball hoop to hang from the wall, so we can go a step smaller with this one from Spalding. With a size of just 18”, it makes for a creative bit of decor that can team up as the ideal means for target practise, whether you’re lazing around in bed or procrastinating over revision.